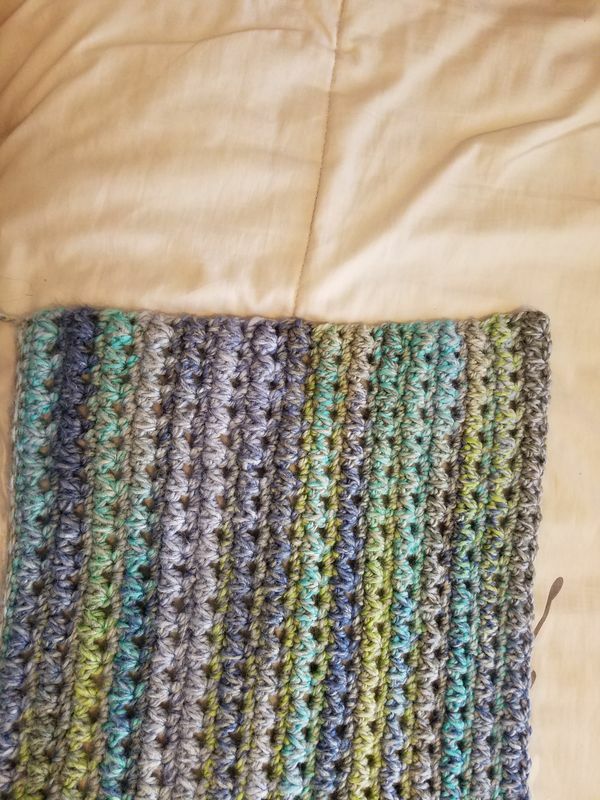 I have not been crocheting very long so not sure what I am doing wrong or if it can be fixed. The pattern says to start with chain 100. I chained 90 but my measurement in length is longer than pattern suggests. Ok, as you can see, one edge is tapering out. Number of stitches is the same. I have torn out and redone several times and frankly right now I could throw it out the window! Acrylic yarn. Could it just be tension? Could it be corrected with steaming? I really am not sure your edge is changing, lay it on a hard surface and measure with a ruler to be sure. If its the same number of stitches likely just gauge fluctuations. Don't be so hard on yourself!! Love the colors and that you are trying to learn how to crochet. Steaming is dicey it can kill the yarn and you can't fix that. First of all it looks gorgeous. What is it that you are making? If it is not something that has to fit..the size does not really matter. Otherwise I believe the issue is your gauge. There are a million, at least, posts about getting correct gauge. It depends on tension, your style, the thickness of the yarn and the size of your crochet hook. Other members will be able to clarify better. That looks lovely! I really don’t see any problem. Sometimes we see things in our work that no one else does, try to see the big picture rather than judging it stitch by stitch. Looking at it stitch by stitch causes total madness! After all, it IS handmade! You do indeed have beautiful stitches. What are you making and what pattern are you using? A link to it would be great. Then we can help determine what's causing your gauge problem. It could be the weight of the yarn, the size of the hook, or both. And as already stated, it might not matter that much. If it does you can get help figuring out a fix. It does not look out of whack to me. It looks great. Often, if just some tension fluctuation, machine washing can help even things out in acrylic. Your stitches look good. I see no tapering out. Always a good idea to count your stitches every row or so; at least until your confident that you're not inadvertently increasing or decreasing. If gauge is important, or if you want your piece to measure similarly to the suggested size in the pattern, you may want to try a smaller hook. Again, I agree with others, your stitches look beautiful (nice even stitches and your edge appears straight). Good luck. If you still have the correct number of stitches it could be your tension, always tricky when just learning. I really don't see anything much wrong with it. If it's a scarf nobody will notice when it's being worn and if it still bothers you, wash it and when it's barely dry lay it out and gently pull it into shape. KEEP GOING! I think you are doing great. keep going! it is perfect. Looks great to me. I think it's the stitch that you're using and the tension. I wouldn't steam or iron it. You're doing great!!! It's beautiful! Your stitches look great! Since your picture is sideways, I'm not sure what stitch you worked...looks like maybe a half dc over two rows? Some crochet stitches look a bit slanted when completed. They will slant either to the left or right depending on what side you're looking at. The slant is common with some crochet stitches. The slant sometimes creates an illusion that the piece is smaller on one side when it really isn't. Since your stitch count hasn't changed, then there's nothing to fix. If it is your tension, just do what others have suggested & wash it & you might even pin it while it's still damp so it looks even to you. Blocking it when done should fix this. It looks fine to me. This is a beautiful stitch, and I think your work is very good for someone who is just learning. Can you tell us what the pattern is?